Product information "XMC1300 Drive Card"
How to stay safe while dealing with hundreds of watts? 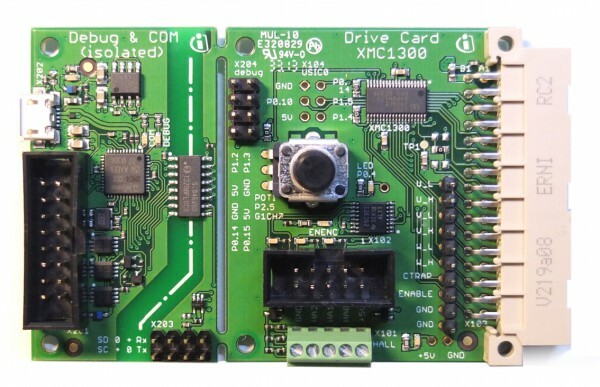 Take the XMC1300 and XMC4400 Drive Card with galvanic isolation. The debug interface is isolated from the XMC microcontroller and the position detection interfaces to guarantee safe operation during software development. The best fit for the XMC1300 and XMC4400 Drive cards is the DAVE™ Motor Control Apps library and X-Spy for SW development and parameterisation. Related links to "XMC1300 Drive Card"
Customer evaluation for "XMC1300 Drive Card"